Selecting the right breed for you and your family is important. The Genesee Valley Kennel Club publishes a Breeders Guide, a list of local breeders of pure bred dogs that we hope will assist you in the selection of a dog. All of the GVKC breeders listed in our guide have signed and agreed to abide by the Code of Ethics. Breeders are accepted with the understanding that the dogs, offered for sale or at stud, are registered or are eligible for registration with The American Kennel Club. 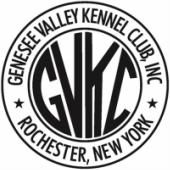 The Genesee Valley Kennel Club in no way endorses the breeders or advertisers listed in our guide. The club is in no way responsible for any dealings with the said breeders or advertisers. Those listed in this guide are under no obligation to provide their services and do so at their own discretion. Care should always be taken when purchasing a pure bred dog. Investigate the breeder, have the new puppy examined by a veterinarian, and make sure that the breeder and you have documented all details in writing concerning the puppy and/or stud service. Comments on any of the breeders in the GVKC guide are welcome. They are to be signed and submitted in writing. They will be taken in consideration by our club. Contact Kris Fletcher for more information regarding submission of comments or complaints. In addition to the printed guide, check out our online Breeder Referral page for information on breeders and advertisers.